Welcome to Sussex County Justice on the World Wide Web! May 22, 2008. Stillwater Police Officer John Schetting Kills Himself with Handgun! New Jersey Supreme Court reverses and vacates Sussex County trial court and Appellate Division wrongful convictions in a stinging 7-0 unanimous decision! Sussex County Judge-Elect Blasts Court! Sussex County Judge-Elect William McGovern III criticizing Sussex County Judges (.wav audio format) in connection with their handling of State v. Cassidy. It was during the 1990's that the State of New Jersey had declared war on American gun owners. It was also during this period that radical Islamic terrorists plotted from within New Jersey's borders to kill Americans and cripple our Nation. [N.1] Terrorists were at war with America while the State of New Jersey was oddly preoccupied with waging war on law abiding firearm owners. One such example of New Jersey's overzealous vigor in the prosecution of American gun owners occurred with the case of Thomas A. Cassidy from 1996 to 2004. It was during this time that the State of New Jersey had brought to bear all of its might against one simple law abiding gun owner. The Sussex County Prosecutor's Office, the New Jersey State Police, the New Jersey Attorney General's Office, the Sussex County Judicial Center, The New Jersey Appellate Division were all focused on prosecuting Thomas A. Cassidy for eight years. All while terrorists remained undetected and plotted to destroy the World Trade Center and the Pentagon. For after all, prosecuting an American gun owner is much easier than investigating and prosecuting a case involving international terrorism. Right, guys? 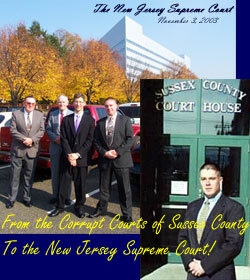 Sussex County Justice was created on March 3, 2000 in response to concealment and cover ups that occurred amongst police, prosecutors, and judges in Sussex County, New Jersey throughout the malicious prosecution of Thomas A. Cassidy. What began as a "routine" act of police misconduct in the middle of the night of March 14, 1996 had since expanded to include the misconduct of prosecutor's, judges, and many others. Sussex County Justice was a case that should have been dismissed at trial. However, in an effort to "get their man" Sussex County Justice officials chose to embark upon an elaborate conspiracy to alter the facts to suit their own political ambitions. It is an embarrassment to the United States of America that corruption in New Jersey is so prolific and systemic. Even the New Jersey Appellate Courts had embraced and upheld the misconduct of Sussex County Justice officials. It wasn't until March 30, 2004 that their conspiratorial malicious prosecution had ended. It was then that the New Jersey Supreme Court had unanimously decided 7-0 to reverse and vacate all of the wrongful convictions that Sussex County Justice officials and the State of New Jersey had worked so hard to secure for eight years. All while 9/11 terrorists plotted and lived among us remaining undetected. This site had been created to let the world know about the dirty little secrets that Sussex County Justice officials have meticulously strived to keep within the geographical boundaries of their own little corrupt county. Indeed, you will witness firsthand a glimpse of a "good-ol'-boy" criminal justice system network in operation. Below we have included a brief synopsis of each section contained within the site. We recommend that you get yourself a cup of coffee, sit back, and relax as we take you through one mans experience of eight years of systemic corruption and misconduct at the hands of the Sussex County Justice system! In the Search & Seizure section you will read about the illegal search and seizure that was conducted in the middle of the night on March 14, 1996. Thus far, there has been no accountability for their illegal conduct. What does this mean to you? When will your home be tossed? In the Cover Charges section you will learn about the "cover charges" that were filed against Tom in a - thus far successful - attempt to cover up the unconstitutional conduct that occurred on the night of the warrantless search. UPDATE! Shortly after the launch of this website the "cover charges" that were placed by Newton Police Detective Anthony Virga were suddenly dismissed after 4 years of their lies! In the section, On the Train to Simple Assault, you will read about the wrongful conviction that Tom was subjected to due to prosecutorial and judicial misconduct and his successful appeal that was hindered by Sussex County Justice officials! Due to the wrongful conviction, Tom was required to Serve a Sentence where he was frequently harassed by the Sussex County Probation Department, illegally interrogated at the Domestic Violence Assessment Center (DVAC) of Sussex County, threatened with contempt of court charges, charged with a Violation of Probation and more! All for crimes that he had not committed, had been reversed on appeal, and subsequently dismissed! You can then read on in The Hindered Appeal about how the Sussex County Justice officials sought to ensure that their wrongful conviction on trumped up cover charges would go unchallenged. The section on the Suppression Briefs documents the Sussex County Prosecutor's Office initial position indicating that a search and seizure had been conducted pursuant to a valid search warrant. Realizing that the police had lied, this section then documents the Prosecutor's interoffice memorandum where they next successfully conspired to cover-up their illegal conduct by relying on the fictitious "cover charges" that were filed against Tom by Newton Police Detective Virga. Indeed, they had strategically set Tom up for a wrongful conviction, and then "latched on" to this wrongful conviction to justify their midnight warrantless search and seizure. We next see how Judge Gerald B. Hanifan, J.S.C. becomes complicit in the fabrication of probable cause and exigent circumstances in the section on the Suppression Hearing. Here we can see where Judge Hanifan relies on the wrongful simple assault conviction to justify the illegal search & seizure. The New Jersey Department of Corrections section traces how Sussex County Justice officials engaged in misconduct to have Tom wrongfully terminated from his previous position as a corrections officer. Here we will see how the Sussex County Prosecutor's Office intentionally faxed false documents to the NJDOC incorrectly indicating that Tom had pled guilty to their trumped up "cover charges"! At this same time they sought to hinder his later successful appeal! Conspiracy to Deprive of Civil Rights takes the reader through a detailed overview of why the Sussex County Justice officials have been conspiring to deprive Tom and his family of their civil rights. Included is the $ 2 million dollar civil rights lawsuit that they never told you about! Here we will also see why Tom was unsuccessful in his attempt to seek justice. In the section that we have included on "Assault Weapons" you will become familiarized with the deceptive practices that high level officials within the State of New Jersey have engaged in to attack firearms owners throughout the State. Here you will learn about their "bait and switch" tactics where officials intentionally mislead the public by discussing machine guns in the context of legislation that deals strictly with semiautomatic firearms- guns in many of your homes right now! Because of this, you too can be maliciously prosecuted under the vague "substantially identical" provision that the legislature has incorporated into this unjust law! The Case Chronology section is just that. It is a lengthy chronology of the major events in the case of State v. Cassidy. It is useful in that we can see through a quick dateline the strategic set up and conspiratorial conduct that Sussex County Justice officials have engaged in. Finally, in the About Tom section, we can learn a bit about criminal defendant Thomas Cassidy. 1 Dwyer, J. (1994). Two Seconds Under the World, New York, NY: Crown Publishers Inc.
See also: (2004). The 9/11 Commission Report. Terrorists plotted and mixed the bomb components in Jersey City, NJ prior to the February 26, 1993 World Trade Center bombing. Several of the 9/11 terrorists lived in Paterson, NJ while plotting their hijacking. Paterson was recommended due to its Arabic-speaking community. Some of the 9/11 terrorists received flight training in Fairfield and Teterboro, NJ airports. Others obtained their photo ID cards in New Jersey as well. Copyright © 2000-2014, Thomas A. Cassidy, All Rights Reserved. This site best viewed with Netscape 4.0 or later or Internet Explorer 4.0 or later.